The following document is part of a series of “Master Narratives” reports compiled for the Director of National Intelligence Open Source Center. A text version of this document was published by Public Intelligence in August 2011. This report serves as a resource for addressing this challenge in two ways. First, it surfaces a set of six master narratives carefully selected based on their potency in the Afghan context and relevance to US strategic interests. Second, this report follows a consistent structure for articulating these narratives and explicitly identifies initial implications for US communicators and analysts. The set outlined here is not exhaustive: these six master narratives represent a first step that communicators and analysts can efficiently apply to the specific messaging need or analytic question at hand. For seasoned Afghanistan experts, these narratives will already be familiar — the content contained in this report can be used to help check assumptions, surface tacit knowledge, and aid customer communications. For newcomers to Afghanistan accounts, these narratives offer deep insights into the stories and perceptions that shape the Afghan political context that may otherwise take years to accumulate. The table on the following page summarizes the six master narratives highlighted in this report. For each narrative, it specifies the relevant audience segments as well as the narrative’s core themes. The condensed narrative description simulates the voice of someone who believes in the narrative itself, helping communicators and analysts immerse themselves in the mindset of the foreign audience. These master narratives were developed and validated through extensive open source research and subject matter expert outreach within the United States and in Afghanistan, and were further vetted by USG Afghanistan analysts. Afghanistan’s master narrative landscape reflects the country’s instability, lack of centralized governance, and underdeveloped education and media infrastructure. As a result, the master narrative landscape highlighted here is different from those analyzed in other Master Narrative Country Reports. Afghan master narratives are hyper-localized: master narratives are recast to suit local conditions where there is no consistent, uninterrupted national dialogue about Afghan history and identity. 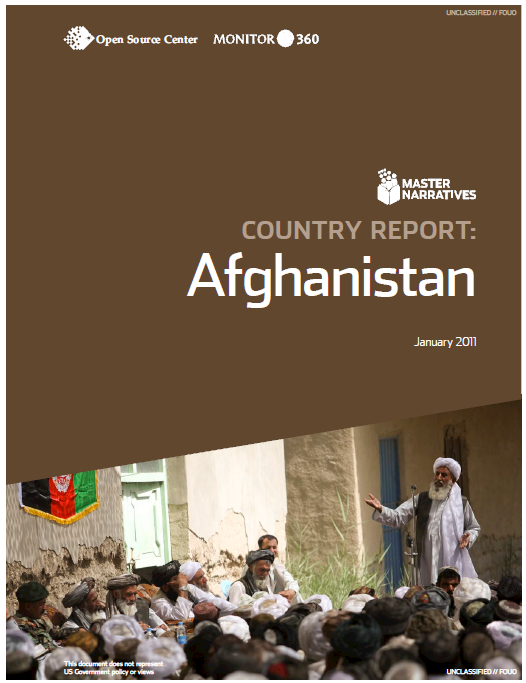 In this respect, Afghan master narratives differ from those in countries where shared national identity or well-developed media environments enable greater consistency across broad audiences. How Afghan groups or communities describe or interpret these narratives can vary widely across regions. This report is a starting point for further exploring this array of localized master narratives, which would require investigating how each is reinterpreted according to cultural, political, and educational conditions at the local or tribal level. Furthermore, localization and underdevelopment leads Afghanistan to exhibit fewer broadly-held master narratives than countries such as Turkey, India, Pakistan, or Iran. Given persistently low levels of literacy, education, and media access, it is arguably more difficult for a diverse set of master narratives to solidify at the national level in Afghanistan than elsewhere. Afghanistan’s master narrative landscape reflects a population capable of unifying in the face of shared foreign enemies or threats while simultaneously being susceptible to violent inter-group tensions. On the one hand, outward-looking narratives correlate with broad public consensus around sentiments of victimization at the hands of foreign powers and a deep-seated pride in Afghan independence. On the other hand, inward-looking narratives correlate with heated public debates over what constitutes legitimate authority in Afghanistan and who should hold that power. For communicators, outward-looking narratives (on the left in the figure below) present messaging challenges pervasive across Afghanistan, while inward-looking narratives (on the right) shed light on the political and cultural concerns of target audiences. For analysts, outward-looking narratives can be used to track shifting attitudes toward foreign actors such as the United States, while inward-looking narratives reflect domestic power dynamics.